Commune 2nd (formerly known as Commune246) boasts many facets of alternative culture, with a slightly stronger showing than most parts of Tokyo for vegan and vegetarian food – for example, neighbouring Dote Cafe, a Hawaiian-style stall, incorporates vegan alternatives into its otherwise omnivorous menu. 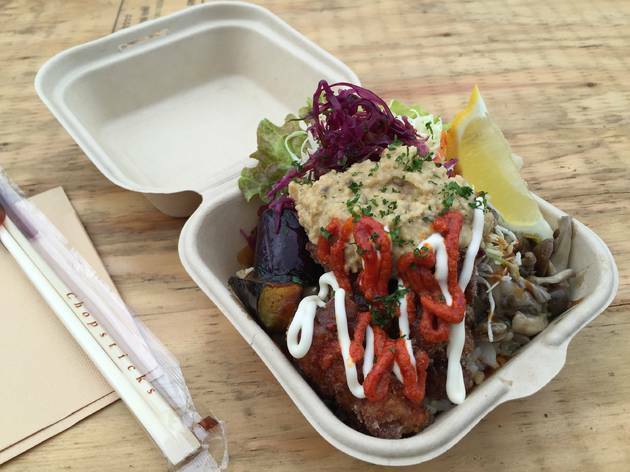 Cori however is entirely vegan, and unlike a couple of the other organic and veggie-friendly stalls, is usually open. 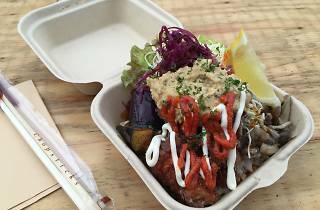 The menu’s brief and dishes are served in takeaway cartons; you can take your meal indoors to a greenhouse-like geodesic dome or to the ‘festival tent’ to sit down and eat. Our ‘spicy vege bowl’ comprised several elements for ¥1,000: hummus, soy nuggets, salad, brown rice, shredded veg salad and tasty garnishes. While it might not be the height of vegan cuisine (you’ll need to go to Kyoto for that) it was tasty enough, and guaranteed vegan, unlike most Japanese food where even vegetable dishes can contain fish or chicken stock. Commune 2nd itself is an interesting place to hang our for an hour or two, making a simple takeaway carton of vegan food worth the special journey.